Yesterday while in the Cherry Creek Habitat I noticed a stunning butterfly sunning itself on the insect hotel. 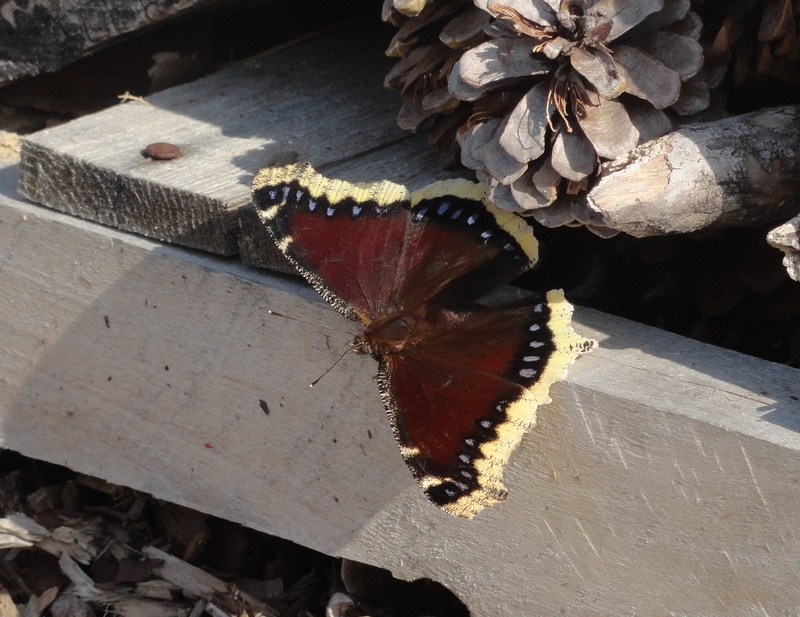 Identifying it as a Mourning Cloak, I researched this butterfly and found some interesting facts. Mourning Cloaks are one of the few butterflies that survive the winter as an adult. They find a sheltered location like a hollow tree, under shutters or shingles, behind a loose piece of bark or in a wood pile. Our insect hotel would be the perfect location for this kind of butterfly to overwinter or seek protection from the cold nights we had experienced the past few weeks. I also learned that the eggs are laid in masses on cottonwood, willow and hackberry trees. We have all three of these trees located behind our insect hotel we built last fall. I am so pleased our habitat is already attracting insect visitors. This is what we had hoped for when we started our project. We are planting more shrubs, perennials, herbs and annual flowers this week. The native bee nest box structure that has graced our office lobby this winter has been moved outdoors into the Cherry Creek Habitat. We did as much as we could to make the structure weather sturdy. The bookshelf/roof and table were treated to be water resistant. The back was covered with a special material and today, I finished up the structure with some caulking. 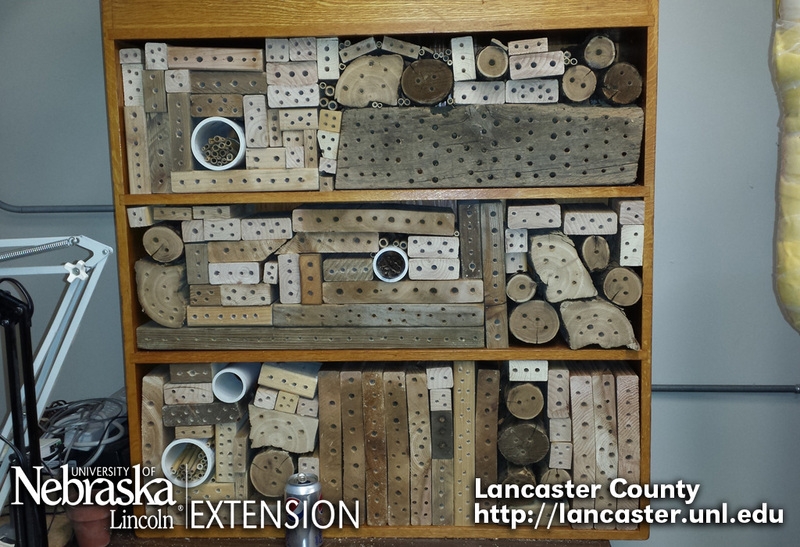 The nesting blocks were put in place and now we wait… OK – honestly, it looks terrific! We keep adding to the pollinator area with natives, herbs, fruiting shrubs and grasses. Oregano, serviceberry, penstemon, blue vervain were planted this morning. We have native chokecherry and wild plum waiting for their turn. 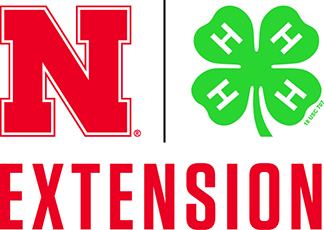 MJ bought some prairie plants at the Nebraska Statewide Arboretum sale on Friday. She also planted a row of special sunflowers with her daughter over the weekend. As for wildlife, a pair of red-winged blackbirds have a nest in the cattails behind the native bee nest box structure. They didn’t scold me quite as much today when I was outside working in the habitat. On Friday, there were several Baltimore Orioles in the Cottonwood tree. Grackles have been busy robbing the insect hotel of anything they can make nests out of and of course, we are finding deer tracks in the habitat after it rains.